The main potential downside risk for the industry is a deterioration in orders from main buyer industries, especially from the automotive sector. The domestic demand situation for steel and metals is currently good, driven by robust demand from automotive, engineering, and construction. Profit margins of steel and metal businesses improved in H1 of 2018 due to stable sales prices and a general price increase since 2016. Margins are expected to remain stable in the coming six months. Payments in the Czech steel and metals sector take 60-90 days on average. Payment experience has been good over the past two years, and both payment delays and insolvencies are expected to remain stable in the coming months. The insolvency level in this segment is low compared to other industries. Our underwriting stance is generally neutral for the iron and steel segment, as local steel production decreased 14% year-on-year in 2017 due to reconstruction and modernisation of domestic steel mills. At the same time the local steel sector is facing overcapacities and competition of cheaper producers from Asia. 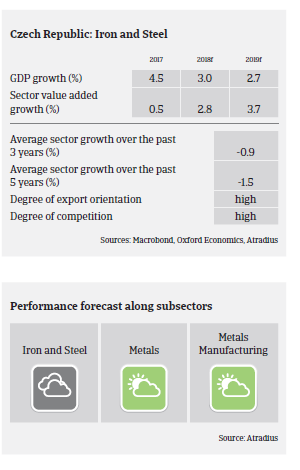 That said, our underwriting stance is open for the metals and metals manufacturing subsectors. Both segments currently benefit from a positive price development, stable margins, a good level of orders and good access to external financing. The main potential downside risk for the industry is a deterioriation in orders from main buyer industries, especially from the automotive sector. To a certain extent sales price volatility seems to be managable for steel and metals companies. The Czech steel and metals sectors are highly export-oriented with the EU as the main destination, while the US market accounts for just 3% of Czech steel and metals exports. Therefore, the impact of US import tariffs is rather low. The percentage of Czech respondents reporting late payment remained largely stable. However, at 89.8% this is one of the highest percentages in the region. Despite improvements in 2018, respondents in Slovakia reported an increase in DSO and 27.5% of businesses seem to have been impacted by late payments. After growing 4.5% in 2017 Czech GDP growth is expected to increase at a slower pace in 2018 and 2019, as Eurozone and domestic demand are cooling down.